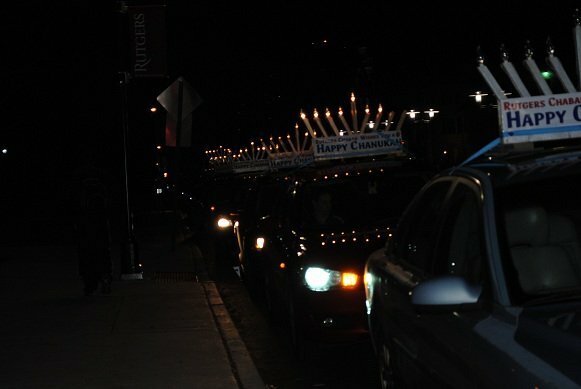 WITH LARGE MENORAS atop their cars, a caravan of students from Rutgers Chabad made their way through the campuses of Rutgers University and through downtown Highland Park to celebrate the sixth night of Hanukka. The brainchild of four students active in Chabad — Jasmine Moradi of West Orange, Talia Friedman and Debra Zauderer of Teaneck, and Effy Gittler of Cherry Hill — the Dec. 2 parade of about 20 cars was a first-time event for the university community. The parade kicked off with the lighting of a giant menora at Brower Commons on the College Avenue campus in New Brunswick before leaving on its journey through New Brunswick, Piscataway, and Highland Park. “People loved it,” said Moradi. “People were waving and smiling, even people who clearly weren’t Jewish.” The freshman said they also stopped along the way to hand out candles and hanukkiot to students.